I will be the first to say that I don’t like horror movies. But, after watching A Quiet Place, I might be ready to change that statement. It’s been 89 days. Since what, we don’t know. The world seems empty save for a single family creeping through an abandoned general store. There is no music. There is no noise. There is nothing except for a thick sense of anxiety and the need to be quiet. We are introduced to the family one by one. Quietly, the mother, Evelyn Abbott (Emily Blunt), gets what they came for– the medication meant for the middle child Marcus (Noah Jupe). Regan, the oldest and only deaf member of the family (played by Millicent Simmonds), watches over the youngest, Beau (Cade Woodward) while he looks at the toys. Beau’s interest in a battery operated rocket causes immediate concern reacting in a short signed lecture by the stern-but-gentle father, Lee (John Krasinski) and shortly after we know exactly why it is so necessary to be quiet. After a deadly encounter, the film jumps ahead a year. The family is back on their farm and Evelyn is expecting. We have glimpsed the foe of the film– a giant arachnid creature that is blind, hunts flesh, and navigates by its extremely sensitive hearing. For the Abbott family, a single sound means death. Krasinski, known for playing Jim Halpert in The Office or for Jack Silva in 13 Hours, directs this creature-feature with a twist. The story (by Krasinkski, Bryan Wood, and Scott Beck) is simple: don’t make a sound and they won’t kill you. But, what we get is so much more than your average thriller. 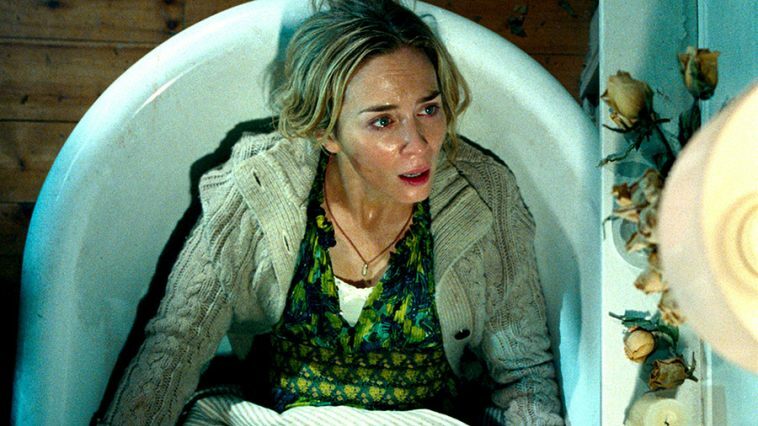 With barely any dialogue, A Quiet Place delivers on the themes of survival, parenting, love, and grief with the limitations of an almost-silent film. The entire cast is made up of 7 actors who all give magnificent performances. But the star of the show is Simmonds. Simmonds (Wonderstruck), who is deaf like her character, delivers a dynamite performance that captures her character’s luckless reality. In a world where noise will kill you to not know when you are making a sound is truly terrifying. Yet, Regan is smart, brave, and stubborn– attributes that may end up saving her family’s life, or ending it. If a horror film is only as the limitations given to its characters, the A Quiet Place deserves an A+. The Abbotts are a resourceful family, but even they aren’t prepared for unforeseen circumstances such as a surprising nail on the basement stairs, an unexpected plumbing issue, or early labor. A Quiet Place is a film that makes it as bad as it can get for its characters, and then makes it worse. Designed to envelope the audience in a blanket of tension for an hour and thirty minutes, A Quiet Place brings the audience along for the ride. In a film where any noise is a jump scare and where the term “it can’t get any worse” is just not true, A Quiet Place is a must see flick that you will not regret.